The distinctive flavor of a Spritz is attributed to the the aperitif Aperol; a spirit with an 11% alcohol contenet combining the extracts of bitter orange, herbs and roots resulting in a citrusy yet bitter flavor. The secret formula for Aperol, which by the way has never been altered, was originally developed in Padua in 1919 by the Barberi Brothers; today Aperol is owned by Gruppo Compari. Interestingly enough Aperol did not become popular until after World War II. Through the aggressive marketing efforts of Compari, the Aperol Spritz has become widely fashionable in the past ten plus years, particularly with the target population of young adults. The Aperol Spritz, generally an inexpensive drink, is often presented with some simple salty snacks setting the perfect scene for early evening gatherings. Venice, Padua and Trieste clamor for origination rights to the Spritz; more than likely the clever combination of spirits resulted during the early 19th century when this portion of Northern Italy was ruled by the Austrian Empire. Evidently, the wines produced in the region were a tad too strong for the gentile Hapsburg soldiers, so they took to adding just a splash or spritz of mineral water to delute them. Gruppo Campari’s traditional Aperol Spritz recipe is three parts Prosecco, two parts Aperol, and one part sparkling water. There are numerous variations on a theme for the Spritz including substitutions with white wine, Campari, and Cynar. You shouldn’t be surprised that my resident mixologist, Mio Marito, has his own special approach to this delightful aperitif, and his version of Lo Spritz is as devine as his Negroni. Trust me when I say it is perfect, just try it in the company of good friends with some simple sputino or snacks early one summer’s evening. If you enjoyed Lo Spritz, please consider subscribing to La Bella Sorella and please share with a friend. Mio Martito makes two versions of this aperitivo, one using Prosecco for a Spritz Frizzante and the second using a dry white wine for Spritz Naturale. Sparkling water is optional, however if you do decide to use it, you may choose to increase the Aperol. Place the ice cubes in the bowl of your stemmed wine glass, add the Aperol followed by the Prosecco or White wine. Garnish with an orange wedge and enjoy immediately. Like you, I love enjoying an Aperol spritz in the summertime – especially if I’m sitting in a piazza in Italy. Campari is a little too bitter for my taste, but this hits just the right note. Oh please do Frank, Cin Cin! Thank you for the recommendation! I will certainly be serving these again!! I am delighted to hear this Michele! 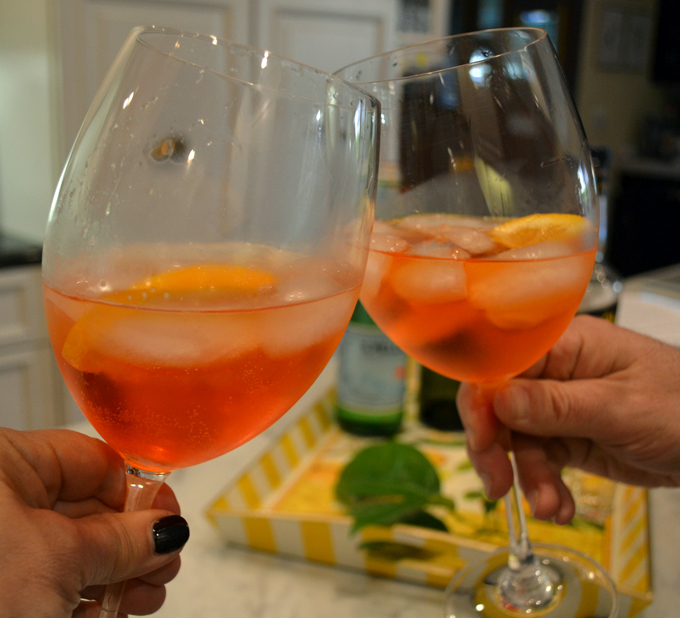 May you have many other happy events to share Lo Spritz with friends.